LIKELY LAST TIME Ghosn indicted on additional charge related to ‘Oman route’April 22, 2019 Prosecutors on April 22 indicted Carlos Ghosn on a new charge of misappropriating Nissan Motor Co.'s funds for his personal use via a dealership in Oman. ABE CONDEMNS ATTACKS Japanese woman killed, 4 injured in bombings in Sri LankaApril 22, 2019 A Japanese woman was among the estimated 290 people killed in the terrorist bombings in Sri Lanka, Foreign Minister Taro Kono said April 22. 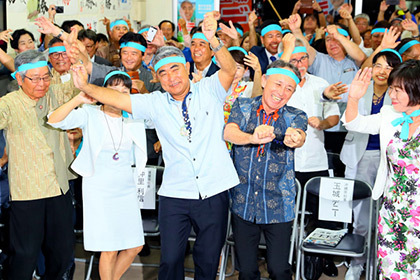 JOURNALIST, BUSINESSMAN WIN LDP loses both by-elections in Okinawa, Osaka prefecturesApril 22, 2019 Candidates supported by the ruling coalition lost in Lower House by-elections held in Okinawa and Osaka prefectures on April 21, raising concerns from Prime Minister Shinzo Abe ahead of the summer Upper House election.